You know you've found a great museum when your 30-something year old friend finds an exhibit and practically screams your name from across the room and shouts, "Come here!!" I had heard about Ibaraki Nature Museum from Alien Times and I sometimes noticed posters or banners advertising their exhibits, but I didn't really have a good sense of what it was all about. The Ibaraki Nature Museum is all about science and nature. 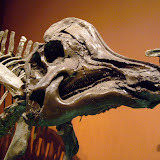 It has permanent exhibits that cover various topics (see below) such as dinosaurs, the senses, and geology. Rather than making you read boring panels about the exhibits, however, this museum lets you interact with almost everything you see. There is an exhibit that lets you pet a real (but stuffed) fox, one that lets you see the world through the eyes of a fish, a grasshopper, or a cat, one that shows you a skull and lets you guess what animal it came from. One of my favourites showed a bat, a grasshopper, a dog, and a dolphin and then let you play a sound. When you increased or decreased the frequency, the animal would move if it could hear it and stop moving when it stopped hearing it. Dogs could hear a huge range beyond what humans could here, but bats couldn't really hear in our range, but had an impressive range above what we could hear. There are lots of buttons to press, videos to watch, and things to touch. It is even possible to take photos throughout the museum, since the exhibits are generally replicas rather than the real thing. Also, they have good support for people who don't speak Japanese. There are pamphlets in several languages and an audio guide system that lets you listen to explanations based on where you are. The system uses a receiver rather than a cassette, so you don't have to listen to the explanations in order. The audio guide system was available in Japanese and English (and possibly one other language, but I forgot to check). I went to the museum on a rainy Saturday afternoon, so I didn't get a chance to explore the outdoor part of the museum. As you can see from the list below, the outdoor exhibits cover a wide variety of topics and might even require their own trip. I strongly and highly recommend a trip to this museum. It is a bit difficult to get there without a car, but it is worth the hassle. If you enjoy thinking about science, and especially if you want to expose your children to scientific concepts, this is a must-see place in Ibaraki. Elementary, junior high, and high school students can get in for free on Saturdays that are not during school holidays (spring, summer, winter break). The museum is located in Bando City, which is west of Tsukuba. The address is Bando City, Osaki 700. I took Tsuchiura Gakuen-sen west and followed the signs for Mitsukaido, Bando, and Iwai. Whenever, there was a choice of roads to take, roads to Iwai won over roads to Bando, and roads to Bando won over roads to Mitsukaido. Once you get close to Iwai, you will start to see signs for the museum ( 茨城県自然博物館 ). Take Tobu Noda line to Atago. Take an Ibaraki Kuko bus for Iwai Shako and get off at Shizen Hakubutsukan Iriguchi ( 自然博物館入り口). It is a 10 minute walk from there.